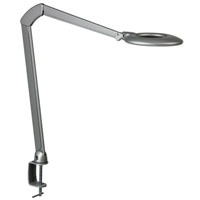 The Luxo Ninety Desk Clamp Task Light is an energy efficient light source which offers a bright, warm light with a high colour rendering index (CRI) making it suitable for any modern office environment. Using only 6.5W of dimmable LEDs, the Ninety incorporates an on-board shut off which automatically turns the light off after 4 hours or 9 hours to ensure energy savings. The Ninety uses a sophisticated lens system to project the light asymmetrically to the work surface. Reflections from the work surface will angle away from the user and not cause glare. A self-balancing spring mechanism and head which can be rotated affords the Ninety an excellent range of motion while enabling the user to adjust their light source with ease. 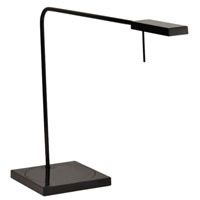 The Luxo Ninety Task Light Freestanding Model is an energy efficient light source which offers a bright, warm light with a high colour rendering index (CRI) making it suitable for any modern office environment. Using only 6.5W of dimmable LEDs, the Ninety incorporates an on-board shut off which automatically turns the light off after 4 hours or 9 hours to ensure energy savings. The Ninety uses a sophisticated lens system to project the light asymmetrically to the work surface. Reflections from the work surface will angle away from the user and not cause glare. 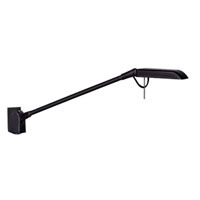 A self-balancing spring mechanism and head which can be rotated affords the Ninety an excellent range of motion while enabling the user to adjust their light source with ease. 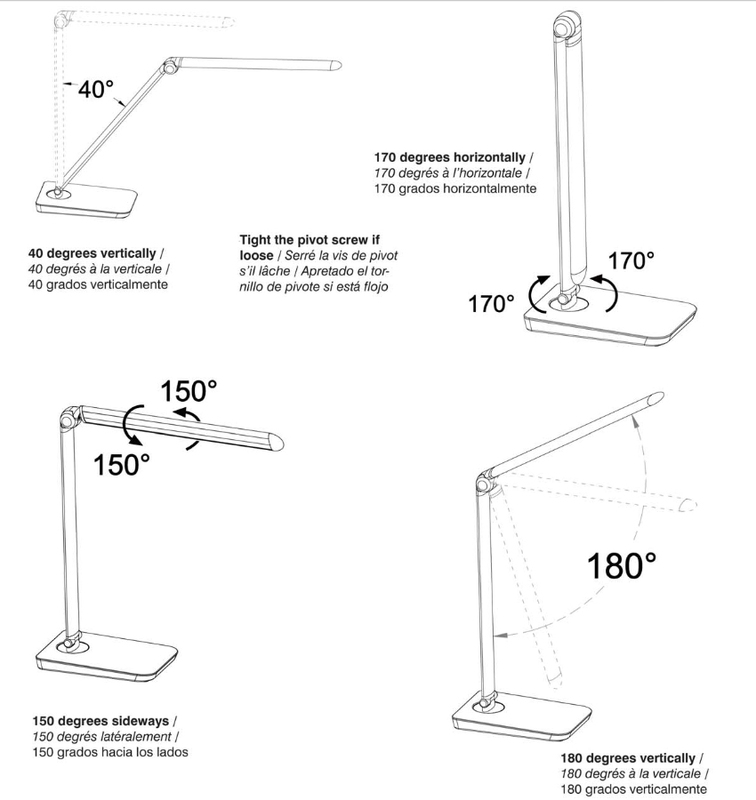 The Vamp LED Task Light from Safco Products provides 550 lumens of energy efficient (just 9 watts) and glare-free illumination suited to any workplace, type of work, or individual preference. Unlike most other LED lights the Vamp LED Task Light provides users with the ability to change the "colour" of the light with the touch of a finger. Users can choose from 4 "cool" levels or 4 "warm" levels, selecting the colour of light which provides them with the optimum in viewing comfort throughout the day. The Vamp base is also equipped with a touch control which provides 8 levels of illumination intensity adjustment regardless of colour mode. Flicker-free illumination is ensured by a 12V power supply and filtered by a frosted lens which ensures soft light dispersion at any of the touch-activated colour or illumination levels. The low-profile stand on the Vamp includes a convenient USB charging port and the streamlined housing will fit on any desk. 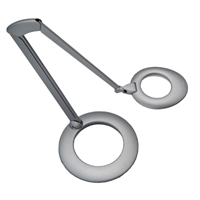 The articulating arm pivots a full 340° within the base and includes 2 smoothly articulating joints for ease of positioning. The head of the Vamp also offers a 300° range of rotation to further facilitate light direction for the elimination of shadows or glare. The Vamp LED Task Light is environmentally friendly, containing neither mercury or lead, and emitting no potentially harmful UV radiation. The Luxo Ovelo Desk Clamp Task Light is an energy efficient light source which offers a bright, warm light with a high colour rendering index (CRI) making it suitable for any modern office environment. Using only 6W of dimmable LEDs, the Ovelo incorporates an on-board shut off which automatically turns the light off after 4 hours or 9 hours to ensure energy savings. The Ovelo uses a sophisticated lens system to project the light asymmetrically to the work surface. Reflections from the work surface will angle away from the user and not cause glare. A covered self-balancing spring mechanism and head which can be rotated affords the Ovelo an excellent range of motion while enabling the user to adjust their light source with ease. The Luxo Ovelo Freestanding Task Light is an energy efficient light source which offers a bright, warm light with a high colour rendering index (CRI) making it suitable for any modern office environment. Using only 6W of dimmable LEDs, the Ovelo incorporates an on-board shut off which automatically turns the light off after 4 hours or 9 hours to ensure energy savings. The Ovelo uses a sophisticated lens system to project the light asymmetrically to the work surface. Reflections from the work surface will angle away from the user and not cause glare. A covered self-balancing spring mechanism and head which can be rotated affords the Ovelo an excellent range of motion while enabling the user to adjust their light source with ease. 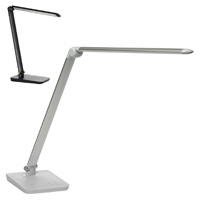 The Luxo Terea Freestanding Task Light is a compact, energy efficient light source which offers a bright, warm light with a high colour rendering index (CRI) making it suitable for any modern office environment. Using three 2.4W (7W total) LEDs, the Terea uses a sophisticated lens system to project the light asymmetrically to the work surface. Reflections from the work surface will angle away from the user and not cause glare. 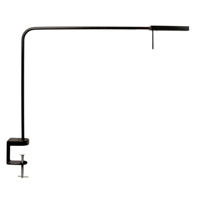 A self-balancing spring mechanism and head which can be rotated affords the Terea an excellent range of motion while enabling the user to adjust their light source with ease. The Luxo Terea Wall Mount Task Light is a compact, energy efficient light source which offers a bright, warm light with a high colour rendering index (CRI) making it suitable for any modern office environment. The Terea is able to mount to a wall or rail with minimal effort. Using three 2.4W (7W total) LEDs, the Terea uses a sophisticated lens system to project the light asymmetrically to the work surface. Reflections from the work surface will angle away from the user and not cause glare. 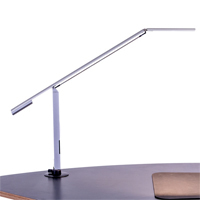 A self-balancing spring mechanism and head which can be rotated affords the Terea an excellent range of motion while enabling the user to adjust their light source with ease. 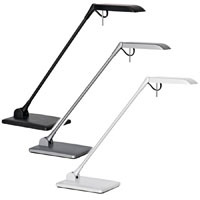 The Luxo 360 Freestanding Task Light is an energy efficient light source which offers a bright, warm light with a high colour rendering index (CRI) making it suitable for any modern office environment. Using only 6.5W of dimmable LEDs, the 360 incorporates an on-board shut off which automatically turns the light off after 4 hours or 9 hours to ensure energy savings. The 360 uses a sophisticated lens system to project the light asymmetrically to the work surface. Reflections from the work surface will angle away from the user and not cause glare. 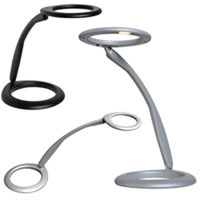 A self-balancing spring mechanism, head which can be rotated, and a rotating base affords the 360 an excellent range of motion while enabling the user to adjust their light source with ease.